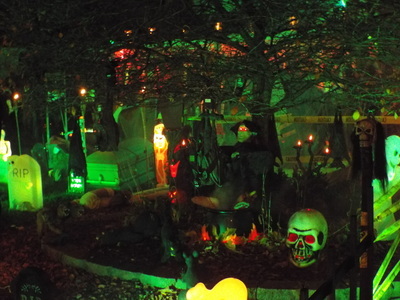 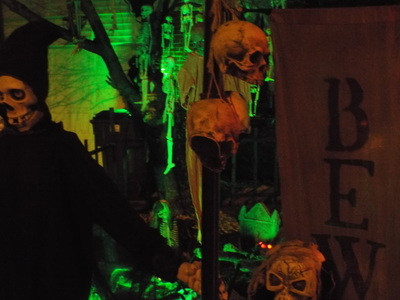 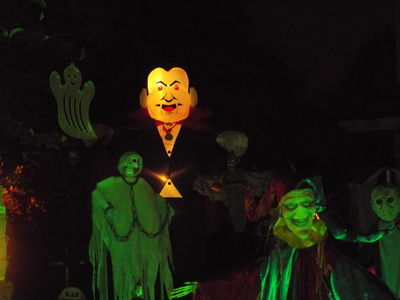 One of the larger yard displays we visit also happens to be in Oak Forest, home to many great haunts including Nightmare on Newport and Frankenstein’s Wedding. 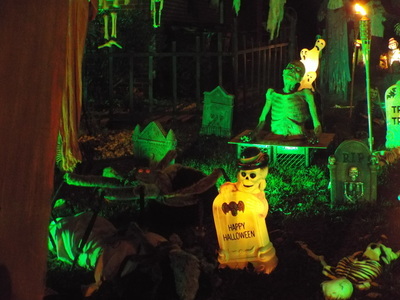 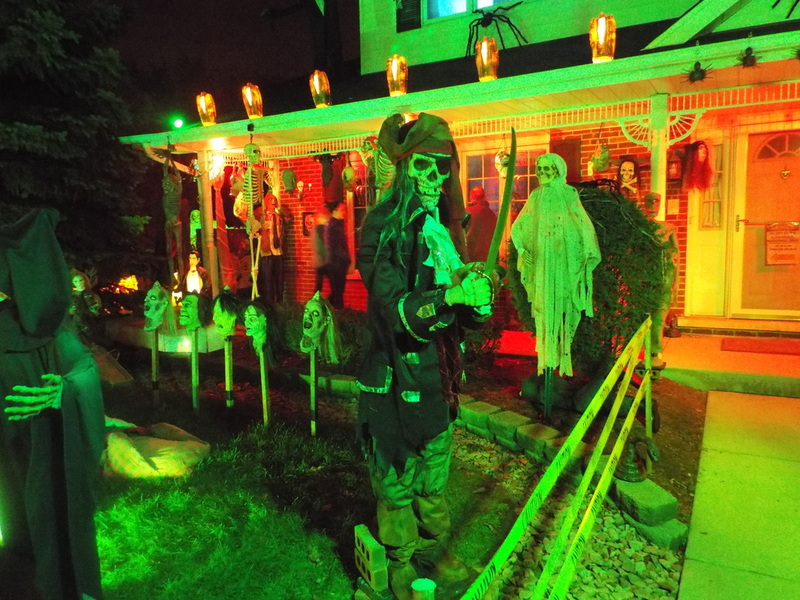 This one, Moe’s Graveyard, features hundreds of props and other items collected on the front lawn, along the driveway, on the porch, and even inside the living room of the owner’s property. We look forward to seeing Moe’s every year, as it always features something new. 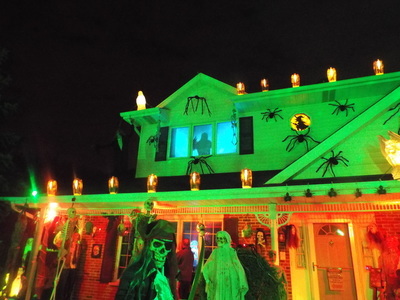 True to form, this year featured a line of light up vultures along the roofline (something we’ve not really seen at other displays), a very cool projection on the garage window that looked as though it was motion-activated as visitors passed by, and a giant tree with dozens of hanging figures attached to it that all seemed to wail in unison when visitors clapped their hands close to it. There are so many props at Moe’s Graveyard that it takes some time to really look at them all. 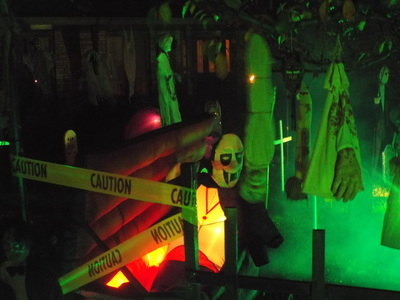 They run the gamut from cutesy inflatable Halloween items to more creepy fare like skeletons and bodies in coffins. All of it is fun to see and experience. 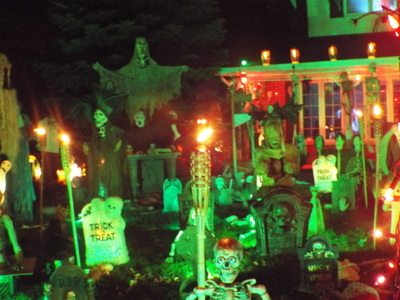 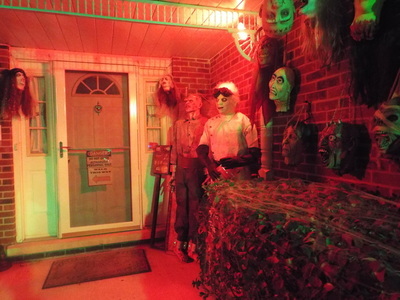 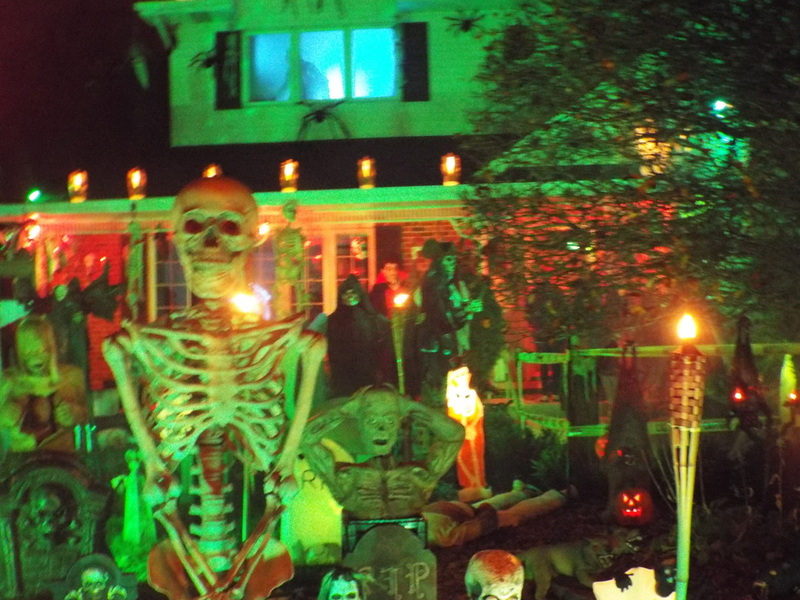 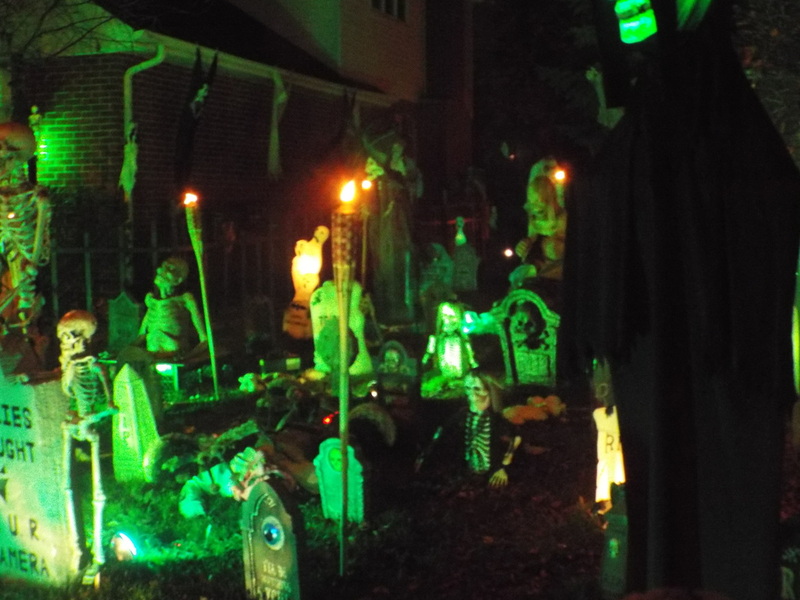 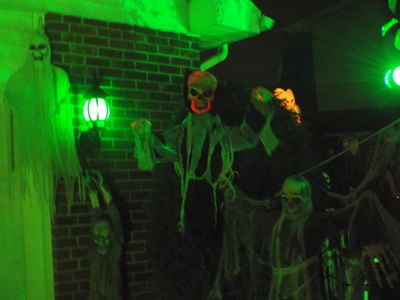 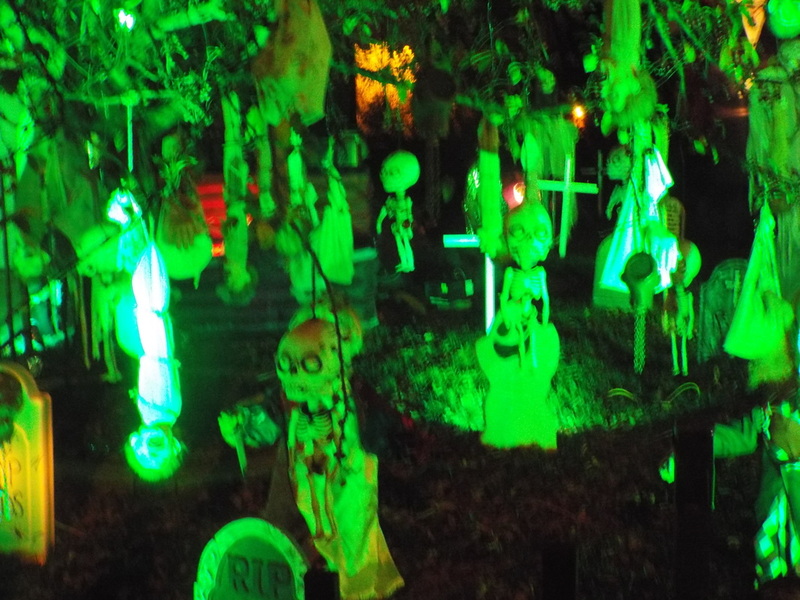 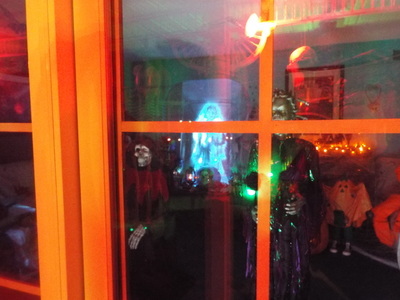 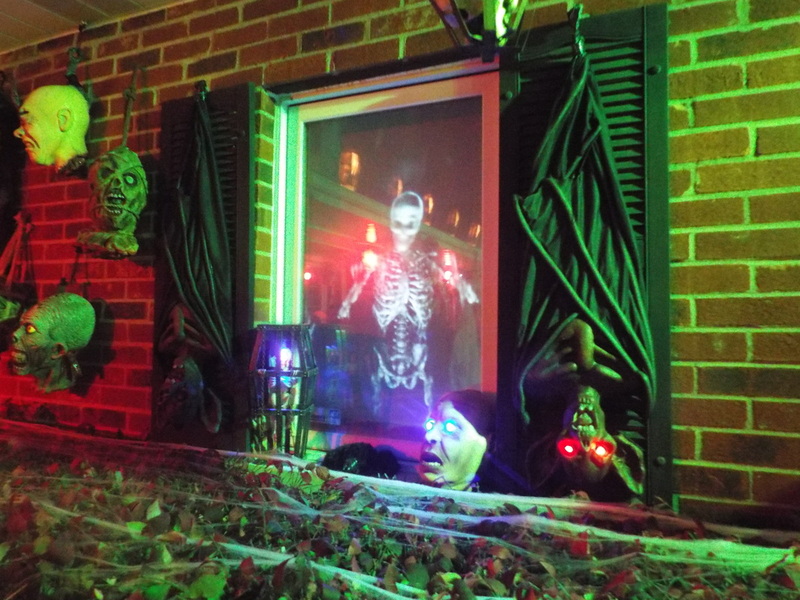 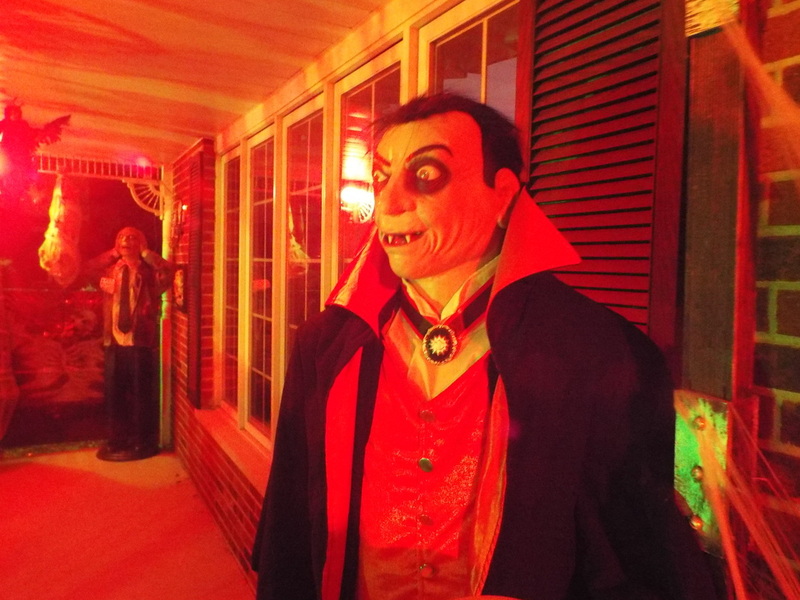 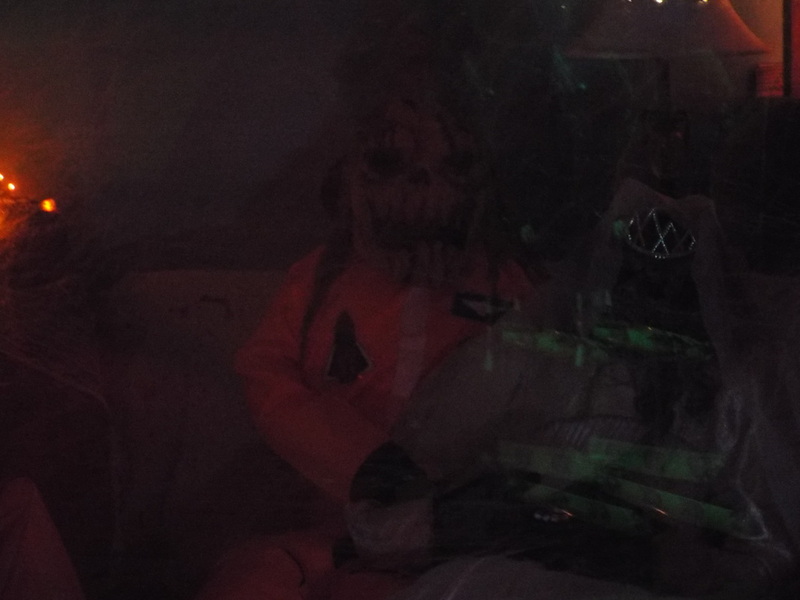 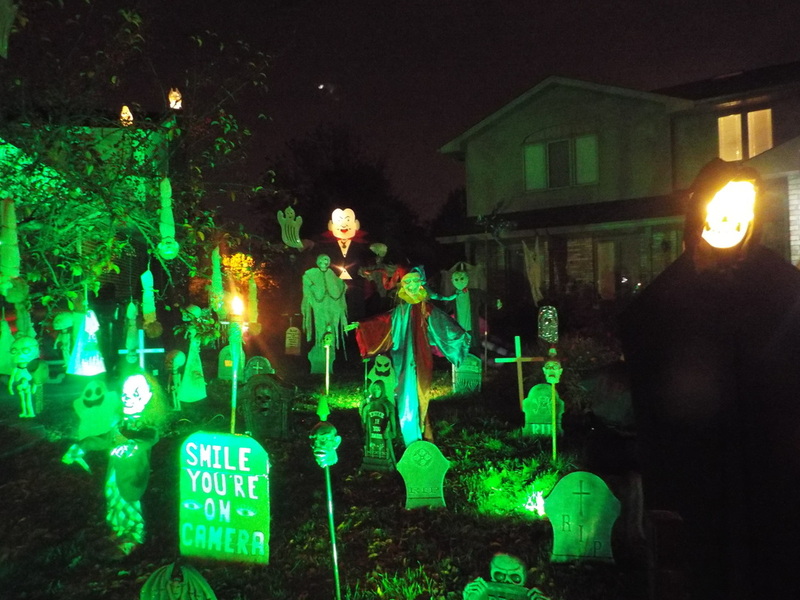 Perhaps the most enjoyable part of the entire display, at least for us, is the front window of the house, which looks in on the living room (or dead room around Halloween time). Each year features a slightly different setup, usually involving some life size figures sitting on the various couches inside. 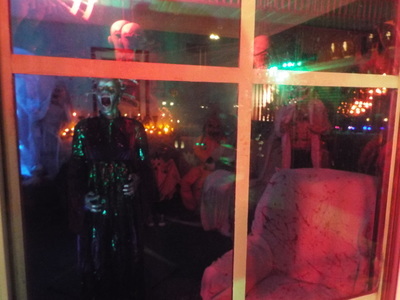 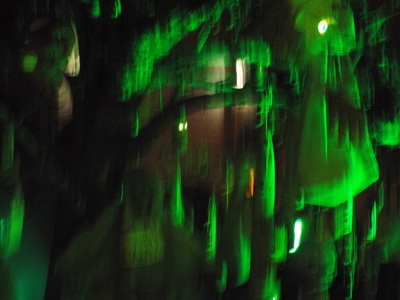 A couple of years ago there was a live figure with a large bloody knife inside who blended in with the surroundings, waiting to terrify unsuspecting window-gazers. 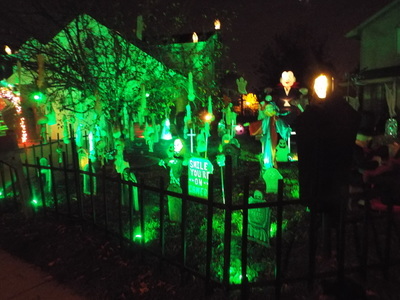 It worked quite well, and we keep looking for moving figures each year when we visit. 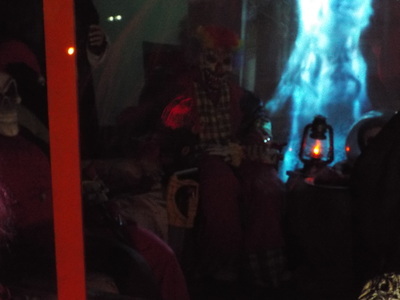 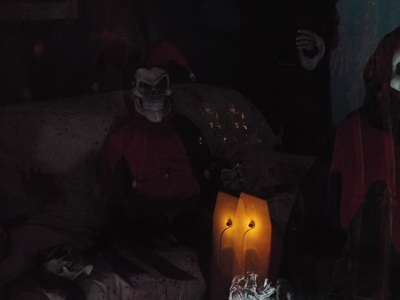 2014 didn’t seem to have any live actors, at least not when we visited, but it did feature a rather creepy looking skeletal jester figure that we had to take a long hard look at before deciding that we was fake. 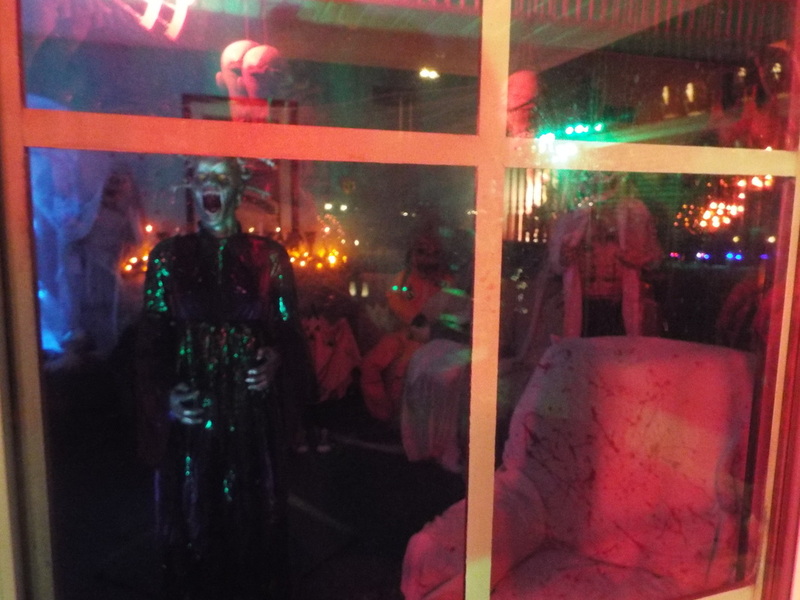 The dim lighting and large number of props inside the house make it hard to discern the live from the unalive, and that’s a great effect. 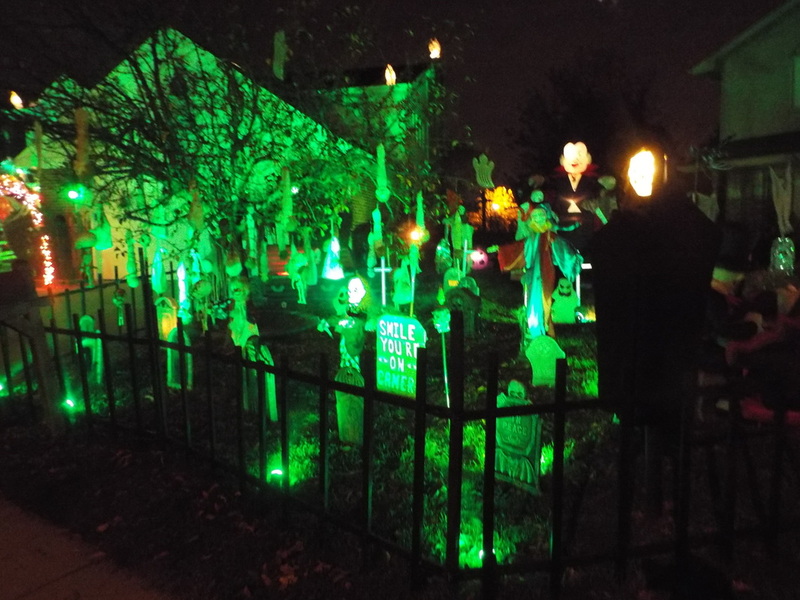 In short, Moe’s Graveyard has something for all ages. 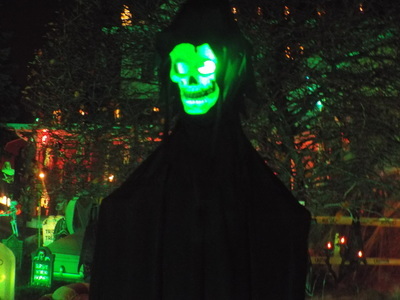 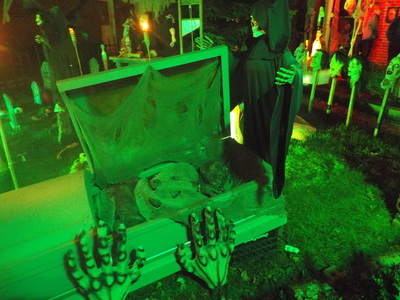 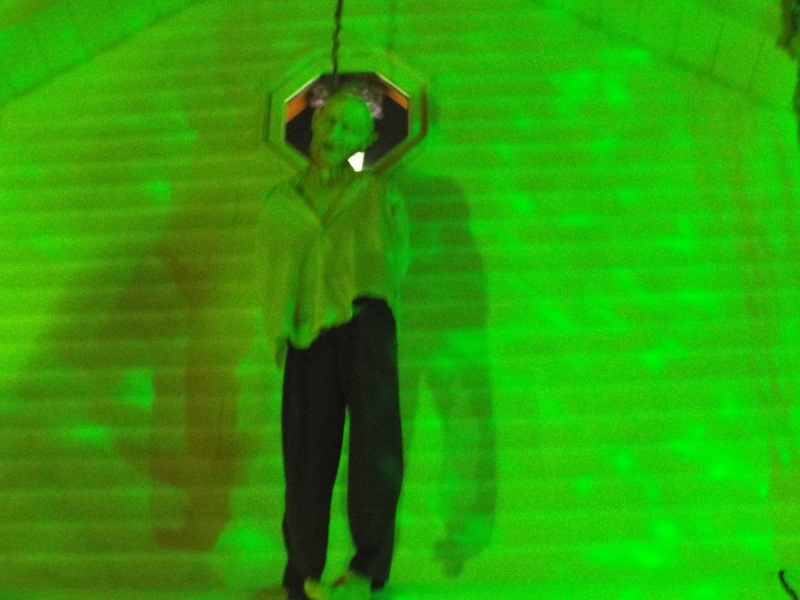 The kids will love the cute part of the display, and adults will like the scarier aspects. It’s well worth a look!